Educating the WholeHearted Child is a must-read book for new homeschooling parents and great resource for veteran homeschoolers as well. The Home section discusses some basics of having your children at home including scriptues to consider on parenting, children, and the Christian life. It also addresses questions of legislation, qualifications, socialization. I particularly like the section on Nurturing and the LifeGIFTS of Grace, Inspiration, Faith, Training, and Service. My favorite part of this section was on Understanding Your Child. It discusses different personalities and learning styles and how to best teach to those traits for success. This is one of my main reasons for wanting to homeschool. My children are individuals and each has their own way in which they learn best. Why make them sit in a classroom and be taught by a random method chosen by our school district? I want to know that my children are taught in a way that makes learning fun, improves retention, and develop in them a passion for learning. I know my child better than any teacher could and I can tailor our curriculum choices to best fit my child. In the Methods section you will learn about specific school subjects, the reasons they are important, as well as age specific issues and concerns for each subject. I particularly enjoyed reading about Discussion Studies Methods because there is a deeper appreciation of books, art, and music when one ponders the work, applies it in the real world and discusses it with others. Discussion brings the work to life and enriches the learning experience. The Living section is perhaps the section I need to re-read a few times. It discusses your vision for your family as directed by God, structure in the home, setting priorities, time management, organization, and support. I think a lot of families could benefit from reading this even if they don't homeschool their children. There are some really great ideas and tools presented here. At the end of the book, you will find a wealth of resources such as book lists for WholeHearted Learning and very useful forms for homeschooling including an agenda, overview, planner, task list, project planner, reading record, book report, and so much more. I love that this book is written from a Christian perspective throughout. With God providing the guidance and equipping in our home, it only makes sense that a go-to resouce such as this would be founding on Godly principles and discipleship. 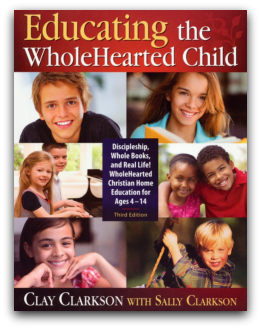 Educating the WholeHearted Child by Clay and Sally Clarkson is available for $22.00 at Apologia Educational Ministries. Apologia offers a wide variety of great resources for homeschooling families including science curriculums, resources and tools for parents, online classes and community, and missions. Note: I was given a complimentary copy of Educating the WholeHearted Child in order to write this review. I was not compensated for my time and my opinions here are all my own. Please check out what others on the TOS Homeschool Crew have to say about Educating the WholeHearted Child.